I’m not a demanding movie watcher, so I don’t insist that my movies immediately begin in some eccentric manner. Nevertheless, I’m always pleased when a beginning is particularly solid and off the top of my head the opening of The Philadelphia Story is definitely somewhere in my top 3 favourite openings. It’s as concise, simple and funny as some films throughout and all without a single word being uttered. Cary Grant comes out of a house, ostensibly dressed for work with his briefcase in hand. Katharine Hepburn comes out soon after – the devoted wife, perhaps? She carries his golf clubs to him, and after a moment’s hesitation breaks it over her knees and saunters back to the door, followed by Cary who with just the slightest pause takes his hand and – with an open palm, mind you – proceeds to sock her. That’s just the beginning, just the beginning…. “They say that the movies you love grow old with you. When I saw The Philadelphia Story for the first time I was a kid who was falling in love with the movies; therefore, George Cukor’s elegant take on the screwball comedy seduced me in the most unexpected ways. I couldn’t believe people as beautiful as Kate Hepburn, Cary Grant and James Stewart could also be “earthly” and feel accessible in the way your wildest dreams can’t help but feel real when you wake up. A few years later as a socially conscious teenager I couldn’t help but admire the smart way in which the screenplay addresses the irregularities of class difference and the term “intellectual snob” became a pet cause of mine. I do love that evaluation on it. It’s one of the great things aboutThe Philadelphia Story. There’s so much going on in it that watching again doesn’t dilute its inherent brilliance. 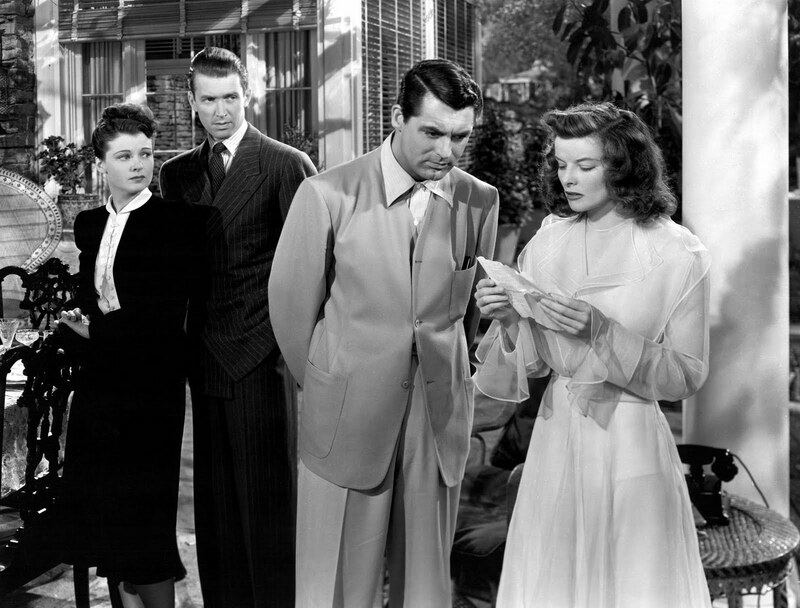 The Philadelphia Story is easily the best comedy I’ve seen, and perhaps will ever see, it is smart and yet silly and for all the serious issues addressed it’s not afraid to be self-deprecating either. I’m always interested when plays are adapted to screen. It’s anyone’s guess how it will turn out. Will it be as “judicious” as Who’s Afraid of Virginia Woolf or Closer? – Or will it be more adventurous – a Cabaret or Cat On A Hot Tin Roof? 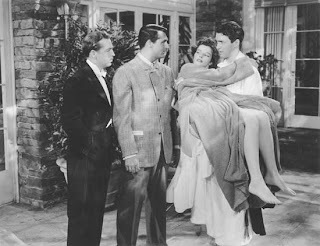 After all – the stage is not the cinema and in adapting The Philadelphia Story Donald Ogden Stewart seems acutely aware of that. 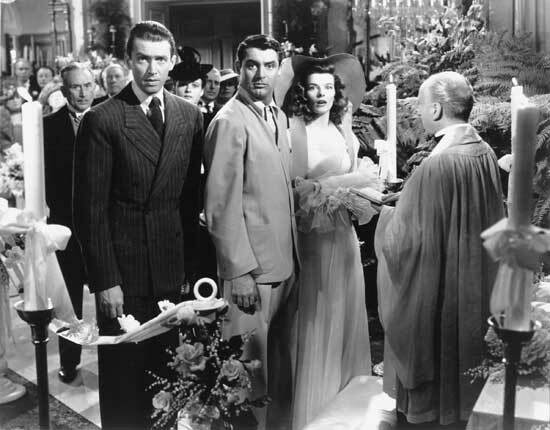 The Philadelphia Story is driven by words, and yet the characters are never relegated to talking heads even with a story that could seem convoluted to the careless viewer. Tracy is getting married to George (a nouveau riche) after divorcing a C. K. Dexter Haven (old money). Tracy’s father is shacking up with some flamenco dancer of sorts and a newspaper is editor is intent on highlighting the scandal; something the affable (yet despicable) Haven is keen on stopping. Enter reporter Mike Conner and his photographer – a Ms. Imbrie. And we haven’t even touched on Tracy’s family yet – her precocious sister, her imprudent Uncle Willie and her careless mother. It’s enough to make even the most confident screenwriter balk, yet Stewart handles it brilliantly, since The Philadelphia Story – above all else, is an actors’ showcase. My bilingual friend from Oxford, Anahita of My Life In Film (currently on vacation) is smitten with this oldie too. Yes, those quotable quotes. I could rattle them all off, but there’s so many. The eternal question is asked, who is the best in show? The best in show is whoever’s speaking at the moment. A favourite scene of mine (and there are many) occurs when Mike and Liz first meet Tracy. Not the real Tracy, but the fabricated one she keeps for the press. As she laments in an affected French accent and saunters around in deplorable fashion I could only imagine Katharine Hepburn laughing her head off inside. Phillip Barry did fashion Tracy after the first lady of cinema. Consider this with another side of Tracy – which we can’t really call the “real” Tracy either. 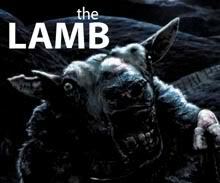 It’s probably the film’s most iconic scene. As Mike and she drunkenly wander about the pool the romanticism of it all is intoxicating. It’s the best I’ve seen Kate (pre-1950) and the best I’ve seen Jimmy Stewart. Everyone’s on their game in The Philadelphia Story, but there’s something especial about the scenes those two share together. They do make a good couple. Yet, it’s a testimony to the two that the scene never feels like too much. Call me a blasphemer, but I prefer these moments with Stewart to the moments with Grant – which are excellent, nevertheless. It actually took me multiple viewings to realise subtle moments of intelligence in the film. As lovely as they seem to exist together, it’s obvious that Tracy and Mike are too similar. Both are too unforgiving of the world around them, and it’s up to Liz and C. K to “whip them into shape” – humanise those intellectual snobs. And the reunion with C. K. Dexter Haven is just right, it is as witty and well played as anything we’d have on screen today. Scratch that – more witty, and probably better played too. The thing about it is that the entire of The Philadelphia Story feels like so much fun. I always remark that Ocean’s Eleven (and Twelve) was proof that a cast of good actors were willing to come together and have fun and though The Philadelphia Story’s cast is not as extensive it does it even better. It’s the sort of film where you want each cast member to be singled out for their contribution. Like Virginia Weidler’s intelligent Dinah. Preciousness in children on screen is a dime a dozen but Virginia Weidler still manages to be particularly inviting without falling into the usual traps (the newspapers were full of “innundo”), Roland Young’s Uncle Willie is a source of some throwaway humour and no one plays better off these moments than Ruth Hussey. I’m almost a bit miffed when persons don’t appreciate her as they ought. Her comedic prowess is in opposition to Kate’s and it works so well in the grand scheme. Her Liz is the source of constant delight as she refuses to be a fourth wheel to the unholy trinity of Grant/Hepburn/Stewart. And they really are an exceptional trinity aren’t they? I have no problems with Stewart’s win; he even manages to outdo Grant who I will admit should have earned a nomination, though. And the marvellous Kate…what’s to say that hasn’t already been uttered? She’s absolutely perfect. – And then some. Luke of Journalistic Skepticism continues on sharing the love for The Philadelphia Story. Yet, I really can’t ignore some of my issues with The Philadelphia Story when I get retrospective. Why must George be relegated to almost villainous proportions at the film’s end? Simply because he’s the only one not comfortable with the class he was born into and wishing to be upwardly mobile? And why must Tracy be punished for her father’s indiscretions? That arc of the film never fails to exasperate me…And it gets funnier – why does Tracy choose Liz as her last minute matron-of-honour? Wouldn’t she have had one for the wedding that already supposed to be in progress? But when I tell you that I don’t care, you can understand just how much I love this movie. Right? It is #4 on my list of favourites…and my favourite Kate flick… and because I’m too lazy to MEME today I’ll just mention that this is my favourite black-and-white film. Was this your "Favorite Movie in Black and White" for Day 14 of the Meme? It's what I chose too!!!! I haven't seen this yet. Everyone shun me until I do. Lovely quotes from all. I agree with R and want to stop working and watch this haha. jess yes it was, your taste is impeccable. simon you'll love it, i'm sure. A great review! Though, look out for calling George "Mike" in your synopsis, and do a Find/Replace for "Katherine" in favor of the correct, "Katharine." ;) You're completely right for considering this Kate's best film and your favorite B&W film - it's certainly mine as well. 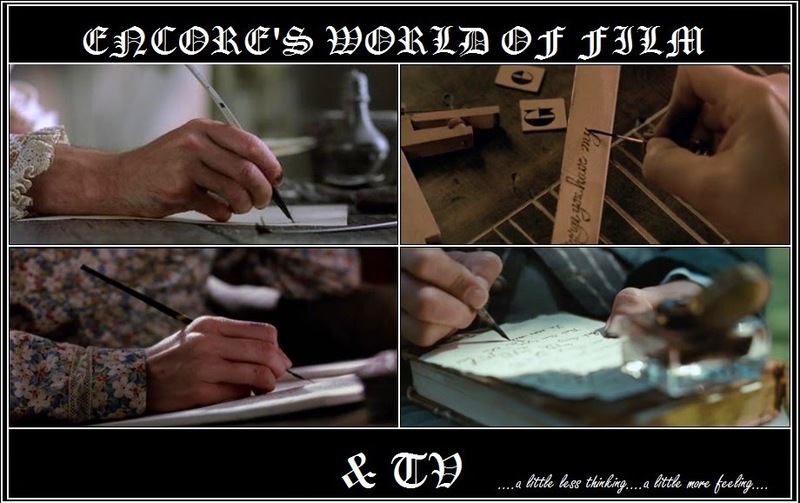 Brilliant script and excellent performances. And THANK YOU for acknowledging Ruth Hussey! daily artist first off, thanks for reading. and in addition, thanks for drawing my attention to those two errors. i'm so incensed when people spell kate's name incorrectly, so it's quite embarrassing that i do it.